When we were in Las Vegas, we had a chocolate souffle with creme anglaise that the girls just swooned over. They had never had a souffle before, so the combination of crisp light exterior and moist, chocolatey interior won them over from the first bite. We decided to try to make them at home. We buttered and sugared the ramekins, chopped and melted semi-sweet chocolate and butter, beat some egg yolks until the ribbon stage, whipped egg whites until they were "stiff but not dry," and gently folded everything together. A little nervous, we tiptoed around and whispered while the souffles were baking. We didn't want them to fall. Christina sat in front of the oven, monitoring their every move. Since we had so much batter, the ramekins were piled high to begin with, so it was no surprise when Christina said ... "Mom, one of them has got a big crack in it ... uh oh, Mom, it looks like the piece is going to fall off ... It fell off ... oh, there goes another one ... oh, and that one in the back just went. Four of the eight ended up looking like lava overflows, but they still tasted yummy. 1) Souffles aren't as hard as I thought they were to make. 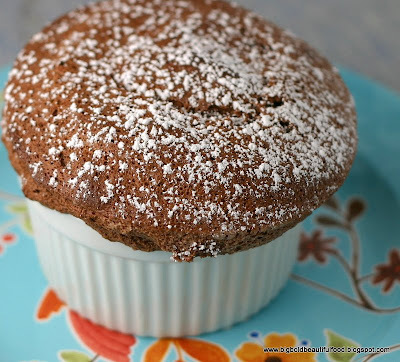 2) Souffles take a *lot* of eggs. 3) If you overfill the ramekins, they'll rise out instead of up. For the souffle recipe, click on this Food Network link. 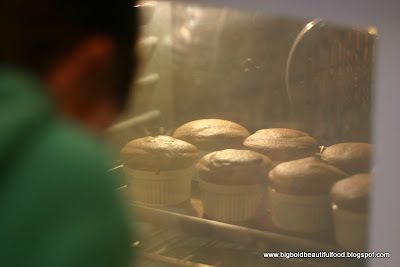 Also, there are great souffle-making tips at this blog. Funny enough, we missed each other in Vegas by days! I am not a baker either, but my better half has made a real go of it the last couple of years and chocolate soufflés is one thing we love. Overflow, popped, or not, they are always good and yours look great! Yes there is something about making souffles that brings out this weird thing in everyone. I used to whisper as well when making souffles and macarons... LOL! They look gorgeous Ninette - no wonder your kids loved them! They seem simple but for some reason, they scare me. Especially how sensitive they are. Where in Las Vegas did you have Chocolate Souffles? We are going in a few months and are looking for a good place to have this special dessert. Costley, we went to Wolfgang Puck's cafe in the MGM Grande. It was across from the Cirque du Soleil show and was an "open" restaurant with no walls.